C&M Auto Service Inc. is excited and proud to be a sponsor of Wild Duck Racing. It is great to see the excitement in Jason and Steve’s eyes when they talk about the races and their accomplishments from over the last several years. Wild Duck Racing does a fantastic job in keeping us informed of what and how they are doing throughout the season. They have presented us with very nice thank you Plaques (built by Steve) with pictures of my staff , Jason and Steve, trophies and the race karts. I have the pictures, and a part of the kart body (with my logo on it) hanging on the wall in my customer waiting area. Steve is always promoting us and his other sponsors whenever he gets the opportunity. I have seen them display the kart and trophies at the Glenview street festival and the Monday night car show held at Old Orchard shopping center during the summers. Of course the kart is displaying all the sponsors’ logos. They are good at keeping up with whole social media marketing thing to get the word out about Wild Duck Racing. It nice to see a young man going out and experiencing racing, learning about the mechanics of the karts, sportsmanship and all the things that go with it. These days too many kids sit around playing video games or get into trouble, this is a lifelong learning experience for Jason and Steve and I am happy to be part of it. I am looking forward to continuing the sponsorship and wish them the very best in the upcoming season. Atomic Decals is a proud sponsor of Wild Duck Racing. 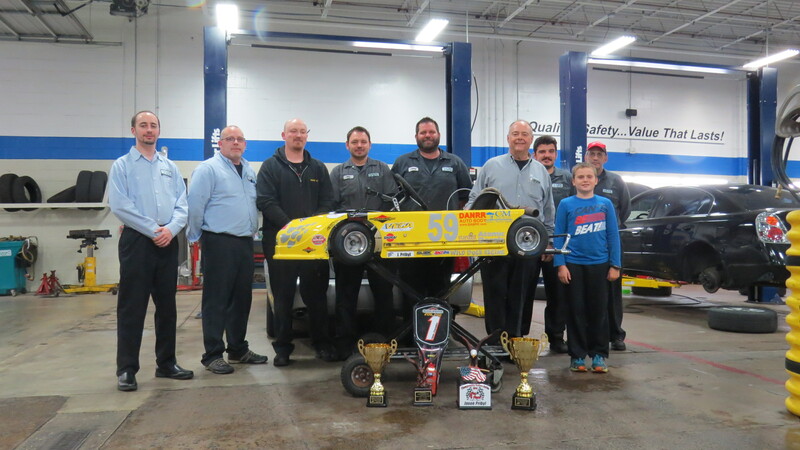 Throughout the 2015 racing season, Jason and Steve – along with the rest of the Wild Duck Racing family – did a fantastic job not only on the racetrack, but in showing appreciation for their sponsors, and did a phenomenal job getting their sponsor recognition front and center. We at Atomic Decals believe our name was represented well on the racing circuit itself with the decals on the racing and transport vehicles, online through blogs and social media, and through word of mouth. We look forward to a great 2016, and continued partnership with Wild Duck Racing. Good luck this year, Jason!